One of our advanced benefits is enabling the citizens to submit videos. 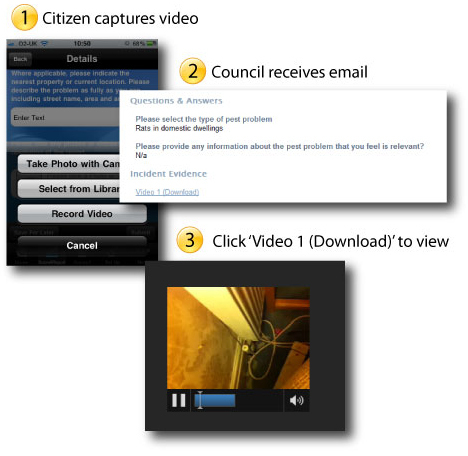 The citizen can either use their iPhone or our website to upload videos. The email is sent to the council with a link to the video which is hosted on our secure server. When you click on the link the video is played in the browser. When submitting a video through the iPhone each video is capped at 9 seconds. This will be quick for the citizen to upload. When submitted through the web site the citizen can upload as many pictures and videos, up to 5mb each.